Some of the programs offered at this facility include earning a GED, basic adult education, various computer and information technology courses, welding, and construction skills. Inmates may also work while in prison in the Colorado Correctional Industries creating furniture, web design, DMV information call center, and more. 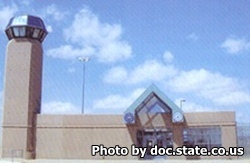 Visiting hours for inmates in protective custody are Fridays 9am-12pm, sign in starts at 8:30am. Visitor sign in for anyone visiting an inmate in the general population will begin on Fridays at 11:45am, Saturdays and Sundays at 9:45am. You must arrive and be processed for visiting before 2pm or you will not be allowed to visit. The maximum number of visitors is 3 adults, and 3 children. If the facility becomes overcrowded inmates will be restricted in the numbers of visitors and visit duration. For more information you can contact the visiting office at (719)-267-5137.